we flew from kathmandu to varanasi, india on feb 6. when planning our trip, india was the only place i was afraid to go. i was afraid i would be surrounded by hordes of desperate, destitute people pulling on my sleeves with outstretched hands, breaking my heart. it all happened, and more. varanasi. holy holy. on the banks of the holy ganges river. regarded as a holy city by buddhists and jains, and the holiest place in the world by hindus (considered to be the center of earth in hindu cosmology). one of the oldest continuously inhabited cities in the world and probably the oldest of india. one of the most important pilgrimage destinations in india. you get it. OLD. HOLY. we stayed in the heart of the old city, wanted to be in the midst of it all. thought we could handle anything after shockingly dirty, poor, mysterious kathmandu. yet varanasi was so overwhelming. all systems on overload. nearby were the ghats, the steps leading down to the ganges river ... over 100 of them. some are bathing ghats, some cremation sites. (hindus believe bathing in the ganges remits sins and that dying here ensures release of their souls.) ancient narrow labyrinth streets. teeming with people from all over india to celebrate their most important life events: to be born, get married, die, give alms. temples galore. monkeys, dogs, cows. silk merchants. maimed beggars lining the alleys to the ghats. (the best place to beg, people give for good karma.) sheer bedlam. we witnessed it all. child wedding processions. bodies on carts being pushed by their families, going to die. burning pyres. so much assaulting the senses, we could only manage to leave our room for a couple hours at a time. after a few days, we fled to dehli. to see the taj mahal in nearby agra. we planned our day-long excursion so we could take the first class train to agra. but our taxi didn’t arrive on time. i will never forget the harrowing scenes in the pre-dawn shadows outside the train station: row after row of people sleeping on cardboard on the side of the road, hundreds if not thousands of them. by the time we got to the station, the only train we could get was second class. and my worst nightmare came true: standing room only. legless, maimed, scarred, destitute beggars – some of them children -- scooting through the car the entire two hour journey, pleading at us, tugging our sleeves, with desperate eyes. we were the only tourists dumb enough to take the second class train. and we knew if we gave anything to even one person, we’d be instantly mobbed by hordes. there was nowhere to hide. on the train, someone told us princess diana was scheduled to be at the taj mahal that day. disembarking the traumatic train ride, we were instantly encircled by taxi men, each wanting desperately to drive us to the taj mahal. desperation driven by survival in a land of too many people and too few resources. curt and i got separated into two throngs, each of us surrounded by pressing, pushing -- and in my case, touching -- men. we finally extricated ourselves into a taxi with one man driving, the other guy facing backward pleading with us the entire ride to hire them as tour guides for the rest of the day for $20. we said no. they kept pleading. we arrived at the taj mahal ... tense, frazzled, heartbroken. buying our tickets at the entrance, we learned the whole taj mahal complex would be closing in 20 minutes so that lady di could have a private viewing. 20 minutes! curt and i were miserable, arguing, blaming each other for this nightmare of a day (and when i think that millions of people LIVE like this. my heart breaks just thinking of it). we didn’t even want to walk together. at one of the most magnificent sites on earth! built in the 1600s by a mughal in memory of his third wife, the grandest gesture of love in the whole wide world. and my love and i, we despised each other in that moment. and then, just like that, we and all the other tourists were escorted out. doors closed. thud. nothing to do but take a walk, regroup, have lunch. curt and i reconnected. relaxed. let the tensions of the morning float away in the afternoon breeze. we returned to the great taj mahal at sunset, lady di long gone. and had the most magical, love-filled time amid the stunning architecture, details and light. hopped the fine first class train back to dehli. took a midnight flight to bombay and promptly checked ourselves into the most luxurious hotel in the city: the taj mahal palace. broke the budget at $200/night. put it on the emergency credit card. we were now the desperate ones, in dire need of peace, calm, safety, cleanliness. (this was the one and only time we stayed in a fancy hotel on the whole trip). were going to spend only one night but couldn’t bear to leave. to leave the fluffy duvet. the spacious clean room. the luxurious bathroom! the heavy white bathrobes. THE SALAD BAR! (we hadn’t had a salad in months – my favorite food -- can’t eat salad when traveling to these places, it’s washed in local water). we didn’t leave the hotel for two days. our spending spree came promptly to an end. sadly and with trepidation, we stowed most of our luggage at the hotel, including both of my cameras. we were heading from the ultimate in luxury to the most primitive of accommodations, on a recommendation from a fellow traveller. talk about how flexible the human spirit can be! in the early morning hours, we embarked on a mind-numbing, 24-hr bus ride. departing the city, overlooking shanty towns for as far as i could see, men squatted by the side of the road for miles, pants down, little tin cans of water for washing beside them. (apparently, indian women go discreetly in the darkness before light.) we indian bus novices were seated right under the speaker blaring jarring indian music the entire 24 hours. it took us a few stops to figure out the bathroom/chai breaks. everyone disappeared so quickly into the roadside (indian version of a truckstop) chaos. i couldn’t find the bathroom our first two stops. the third stop, in desperation, i decided be one of the first off and follow the women to the “bathroom”. oh dear. it was really just a squatting place, kind of in an alley by the side of the building, no real facilities. about as disgusting as it gets. we arrived in diu, a fascinating melange of india and portugese influence. we had been told to find the albino lassi man. that was all we knew. but the lassi man (lassi: that yummy drink of mango and yogurt, the indian version of a milkshake) wasn’t there. we waited in the little town square in the heat of the day for hours. as people started coming out from siesta, so, too, did the lassi man! 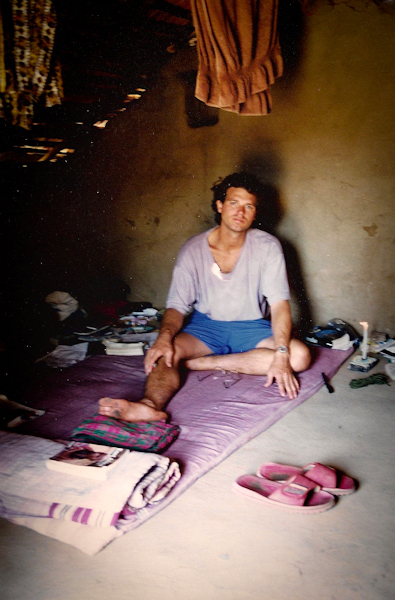 we paid him our fee of 15 rupees (25c per person per day) for the week for a hut, a “mattress” and our cooking gear. and he pointed the way to hut number 8.
the huts rented to budget travellers sat on a bluff outside a peaceful little fishing village. all the men were away fishing. the women, children and old folks remained. what a treat to witness village life up close. our mud hut was cosy and dirty, but fun! we could use the running water in the village to wash, but it only came on sometimes. after a few days, we finally figured out it came on for a brief time with a generator pump which we could hear from our hut. so when it came on, i hurried over to the village to wash my hair. as the mornings warmed, the biting flies woke up, too, forcing us to leave our hut by 8:30am each day. we went to the beach. in the evenings the village women and children would come around to sell us food. as i got to know some of them, one day i mustered up the courage to walk through the center of the village. there was even an englishman living in this village, an artist. it was all so dirty, so poor, so basic. but the people were lovely and warm, shy but friendly. we had ventured from the village into the larger town one day, and the place was spectacular with run-down beauty. but i hadn’t brought my cameras! so on our last day, desperate to make pictures, i borrowed a camera from one of the other travellers in a neighboring hut. i think i gave him my passport as collateral. still, i can’t believe he lent me his camera, what trust. wow. the comraderie among travellers is astounding. there’s a sense that we’re all together in this travelling way of life, separate from the locals but joined by our journeying. that day, i found the picture making to be the absolute best on the entire RTW trip! with borrowed camera, humbled. after diu, we made our way to bombay to fly onward to nairobi. in the bombay airport while waiting for our flight, i watched a young western guy dressed in white indian kurta wandering around aimlessly, alone, muttering to himself. after watching him for awhile, i approached him to see if i could help. he was completely stoned on something. something strong. heroin maybe? he wanted to get home to england. he didn’t know where he was. he couldn’t find his ticket or a passport, if he even had them. i tried to find an airport official who could help this man. but it was time for us to catch our flight. and we left. leaving behind so much desperation. and so much richness. so much life. lessons learned: don’t sit under the speaker on indian buses. don’t leave my camera behind, ever! see the inner human beings behind their desperate circumstances. 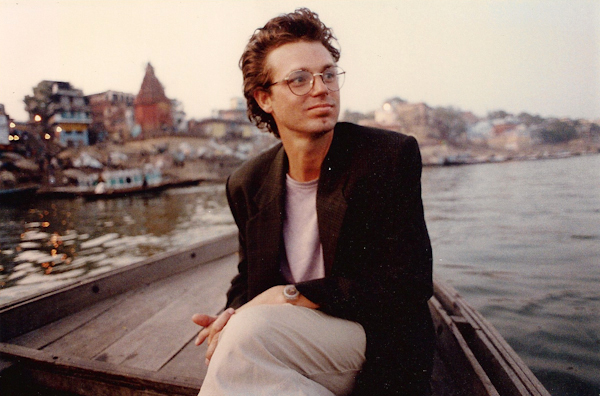 ps – i’ve returned to india twice, both times spent in the peace of ashrams. i will return. pps – favorite indian movies: slumdog millionaire, water, monsoon wedding, lagaan. favorite book about india: shantaram.